Well, that took two days. I have no idea why Nikon pre-announced the KeyMission 360. I thought that was a foolish idea, and Thursday night I was basically proven right: GoPro announced they’ll have something equivalent shortly. 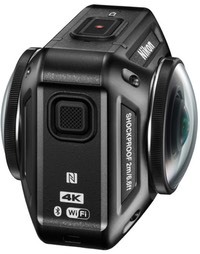 I suppose someone at Nikon thought the right thing to do was to appear to be the “first mover” in the 360° action cam market, but the action cam market is already more than half owned by GoPro; it’ll be difficult for Nikon to dent it no matter how good their product since it’s unlikely to stay unique, and inefficient marketing won’t make that easier. That’s especially true since Nikon seems to have mostly missed one critical aspect of the action cam market: how it attaches to the actor. Nikon thinks it does this via a tripod socket. GoPro already has a huge ecosystem supporting attachments of all types. Sure, Nikon showed some (flimsy) things that screw into the tripod socket, but I still think that misses the point. Having rigged GoPros on drones, boats, vehicles, stages, skiers, kayakers, climbers, swimmers, and a host of other things, I can tell you that any action cam user has a box of rigging they use. Little is done via tripod socket, as when it involves another component it adds a connection that can be insecure, especially when you use plastic parts for swivels, as at least one of the Nikon items does). I like the idea behind KeyMission 360. I hate the name, and I dislike the attachments so far shown. I wonder if I’ll like the software ;~). And I really didn’t like the pre-announcement. I’ll end up hating the pre-announcement if, as some suspect, we’re going to learn some drawback to the device (note the 3-minute 4K recording limit to the D5: that would be a giant Fail on the KeyMission 360). But it comes back to this: Nikon needs to stop trying the go-it-alone thing. KeyMission, just like Nikon 1 and the DSLRs, should have an abundant, well-informed, vibrant third party set of players supporting the “Nikon Ecosystem.” Did Nikon miss that GoPro did that and the developed ecosystem is a large part of their success? I had some hope when I saw that Nikon had teamed up with Atomos to support the Atomos API for controlling cameras from the Ninja and Sumarai line of external video recorders, but that’s Atomos extending their ecosystem, not Nikon extending their’s. Still, the Atomos support was promising, as Nikon rarely supports any other third party player at the retail level (they have a lot of coopetition going on in things like sensor designs, etc., but that’s not the same thing and the consumer never sees options other than Nikon’s that result from that). Meanwhile, we have the SB-5000. Everyone, including NikonUSA is still scrambling to try to figure out all the nuances of this new radio-frequency remote flash thing. Almost everyone seems to be missing that the WR-R10/T10 set plays into this. We were always wondering why Nikon had created a US$278 wireless controller that seemed to be nothing more than what you can pick up out of Hong Kong for US$20. Well, it turns out that this sleeping transceiver was just waiting for something other than a camera to control. But that leaves the question: why are the D5 and D500 the only cameras that can use it to trigger an SB-5000 wirelessly? Or are they? Nikon’s currently saying no, that the D5 and D500 are the only ones that can configure the WR-R10 to do what it needs to do. Okay, but maybe a firmware update for the D4, D750, D810, and D7200? Not currently being suggested as likely. Moreover, that sort of plays against an age-old Nikon engineering conceit: new technology goes in a new generation of cameras and then rolls down to the lower end in subsequent models, and never rolls back to previous models. Nikon’s always had a terrible time with accessories. Oh, they make them. Often they have some really interesting technology and ideas in them. And then they overprice them, under produce them, under support them, and just don’t let anyone else play on the same field with them. For the common accessories—the MB-D## vertical grips, for example—these things just get reverse engineered in China and produced for less. About the only drawback I’ve ever found with those knockoffs is that the quality control is more variable than Nikon’s. If you go that route, buy from a vendor that will exchange without question. It seems to me that the WR-R10/T10 needs a lot more explanation and support from Nikon if it’s really going to help us with our SB-5000’s. Will it get it? History says no. Maybe history won’t repeat itself, but I won’t take that bet. Lenses are accessories ;~). And the thing that keeps coming to mind is “what the heck lenses am I packing with my D500 in the future?” Sure, Nikkor telephotos at the long end, that’s a given now considering how good the last few Nikkor telephotos have turned out to be. Mid-range? Okay, the recent 16-80mm f/2.8-4 looks like a very nice mate there, though a number of people are going to wish it were just 16-50mm f/2.8, or maybe a 16-xxmm f/2-2.8. But primes? Wide angle? Yeah, the paucity of DX lenses is still hurting Nikon. We’ve got Olympus getting ready to launch an f/1.2 prime lens set for m4/3, and Nikon has exactly one f/1.8 DX prime after 17 years. Yes, 17 years. Can someone wake up the DX wide angle group? They appear to have fallen asleep in their cubicles from too many nights of too much saki. Good thing those third parties Nikon wants to discourage have been awake, but even there we haven’t gotten wide angle primes, just some really good wide angle zooms (anybody still remember the superbly sharp Sigma 18-35mm f/1.8? While it’s too big to be considered by the “prime boys”, it certainly has the optical characteristics they’d want and nicely covers the 28mm (equivalent) to normal focal range). I applaud Nikon for the D5 and D500. Other than perhaps some video miscues, Nikon has done what they needed to do with these two (likely to be seminal) cameras. The enthusiast lineup is well restored and mostly rationalized, as I noted in an earlier article. That was one of the many things I’ve been asking Nikon to do. The new models also seem to be communicating with the modern world better, too, another point on my to do list for them. But Nikon is still making things more difficult on themselves than it has to be. Tried tethering a Nikon DSLR to a Macintosh running El Capitan lately? It’s the things around the cameras that are causing Nikon (and the user base) grief. We see some progress being made and then something breaks for us. Or we can’t get it because they didn’t make enough (hint: buy your WR-R10 kit now). Or we can’t quite figure out how to get things to work the way we want them to and support can’t really help us. I’ll have a bit more to say about this soon. An article I thought I had finished needed some re-writing after the D5/D500 introduction. But here’s the thing: I’m in a good mood at the moment re: Nikon. They started the new year with a solid win on the DSLR body front, and they ended the previous year with some solid wins in the lens arena. Excellent. But we need more than that from them now, and the video thrust they tried to make at CES fell a little flat. I’ll be going to NAB doing press coverage this year, so I’ll be able to tell you how flat once that pivotal video convention hits in Spring. So Nikon, if you’re reading this: thanks for all the fish. Please send more.